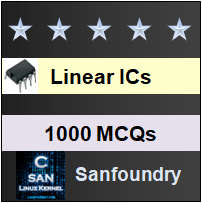 This set of Linear Integrated Circuit Multiple Choice Questions & Answers (MCQs) focuses on “Basic Principles of Sine Wave Oscillator-1”. 1. What is Barkhausen criterion for oscillation? Explanation: The Barkhausen criterion for oscillation is Aß = 1. Where, A-> gain of amplifier and ß-> transfer ratio. 2. At what condition the output signal can be continuously obtained from input signal? Explanation: When Aß=1, the feedback signal will be equal to the input signal. At this condition, the circuit will continue to provide output, even if the external signal is disconnected. This is because the amplifier cannot distinguish between external signal and signal from the feedback circuit. Thus, output signal is continuously obtained. Explanation: An oscillation is a type of feedback amplifier in which a part of output is fed back to the input via a feedback circuit. 4. Find the basic structure of feedback oscillator. Explanation: The above mentioned diagram is the basic structure of feedback oscillator. It consists of an amplifier, to the external input (vi) is applied and it have a feedback network from which the feedback signal (vf) is obtained. 5. What is the condition to achieve oscillations? Explanation: All the conditions should be simultaneously satisfied to achieve oscillations. Explanation: If |Aß| becomes less than unity, the feedback signal goes on reducing in each feedback cycle and oscillation will die down eventually. 7. How sustained oscillation can be achieved? Explanation: When |Aß| is kept slightly greater than unity the signal, however, cannot go on increasing and get limited due to non-linearity of the device (that is transistor enters into saturation). Thus, it is the non-linearity of the transistor because of which the sustained oscillation can be achieved. 8. Why it is difficult to maintain Barkhausen condition for oscillation? Explanation: The Barkhausen condition |Aß|=1 is usually difficult to maintain in the circuit as the value of A and ß vary due to temperature variations, aging of components, change of supply voltage etc. 9. Name the type of noise signal present in the oscillation? Explanation: Schottky noise is the noise signal always present at the input of the transistor due to variation in the carrier concentration. 10. A basic feedback oscillator is satisfying the Barkhausen criterion. If the ß value is given as 0.7072, find the gain of basic amplifier? => A=1/ ß = 1/0.7072 = 1.414. Explanation: The feedback signal of an oscillator is given as the product of external applied signal & the loop gain of the system. 2. The total phase shift of Aß=0o or 360o.